Hippocampal neurogenesis is required for some types of hippocampus-dependent learning. The functional relevance of adult hippocampal neurogenesis has long been a matter of intense experimentation and debate, but the precise role of new neurons has not been sufficiently elaborated. Many factors enhance hippocampal neurogenesis including hormones, growth factors, drugs, neurotransmitters, and physical exercise as well as learning a hippocampal- dependent task. Other factors suppress hippocampal neurogenesis; these include aging, stress, glucocorticoids and stimuli that activate the pituitary/adrenal axis. Recently, much attention has focused on the relevance of hippocampal neurogenesis to the pathophysiology and treatment of mood disorders. Indeed all major pharmacological and non-pharmacological treatments for depression enhance hippocampal neurogenesis and suppressing hippocampal neurogenesis in mice blocks behavioral responses in some antidepressant-sensitive tests. The present review highlights the functional significance of the adult hippocampal neurogenesis, factors affecting the same, study its effect on learning and how it responds to brain injury (especially in depression, epilepsy and Alzheimer’s disease). Thus, the dysregulation of adult neurogenesis may contribute to their pathogenesis and ultimately lead to developing effective therapeutic interventions for the same. Hippocampal neurogenesis; Dysregulation; Depression; Epilepsy; Alzheimer’s disease; Therapeutic interventions. Adult neurogenesis has been highly conserved throughout evolution; it has been observed in the central nervous systems of both invertebrates and vertebrates such as fish,birds,and mammals [1-4]. The belief is that,in the adult life,neurons can only die and no new neurons are generated can be regarded as the “central dogma of neurobiology”,which has strongly influenced basic and applied neuroscience research as well as clinical practice before 1950s. In general,it was supported by the idea that the extreme specialization of the cerebral functions of mammals was incompatible with the generation of new neurons. However,a number of methodological,technical and conceptual drawbacks were responsible for the historical denial of adult neurogenesis so that the path to overturn this dogma has been long and full of obstacles. Once,at the beginning of the 1990s,neurogenesis in the adult brain was demonstrated,a rush to find therapeutic applications commenced,sometimes disregarding new and unexpected findings that had emerged. Although the discovery that there are limited areas of the brain where neurons do regenerate is important,it has deepened our curiosity as to why it is that most neurons in fact cannot replicate. One reason why neuronal replication in the adult was considered unlikely was the complexity of most neurons; with their highly branched dendrites and polysynaptic axonal combinations,they were considered to be terminally differentiated and unable to re-enter the cell cycle and divide,strictly from a mechanistic view. Another problem was conceptual. If neurons were able to divide,how would the newly created cells with their new dendrites,axons,and synapses,functionally integrate into the brain without disrupting existing circuits? With the dominant theories of brain function being based on a computer analogy with fixed circuits,it did not seem at all logical that adult brain circuitry could be continually adding new components. With the advent of complex imaging technologies,the mighty brain has been conquered in a novel way. Till 1960,scientists considered it to be immutable,subject only to genetic control. Then,in early sixties,they began to speculate that environment might play a significant role in moulding the brain structure. Bennett et al  then experimentally proved that the brain morphology and chemistry be altered. This changed the prevailing presumptions about the brain’s plasticity (Diamond et al. ). The novel concept arises is: it is nature,then nurture. Here,genes (nature) provide each brain’s basic building blocks. A variety of molecules play crucial role during the cortical genesis. For instance,Pax6,a member of the Pax family of transcription factors and a master control gene in the ocular development,has been found to contribute in the development of central nervous system and also in postnatal neurogenesis . Takacs et al  studied the morphological and functional maturation of doublecortin (DCX) in postnatal mouse brain from day (P) 2 to day (P) 22 and concluded that neurogenesis appeared earlier in the rostral migratory system (RMS) than in the dentate gyrus (DG). Little is known about how adult neurogenesis is regulated by gender and endogenous levels of estradiol,a gonadotropic steroid hormone in the mouse. Lagace et al. concludes in a study that there is no such influence in the female mice (C57BL/6) by estrous cycle or post ovariectomy. With chronic treatment with fluoxetine,there was a greater increase in the number of BrdU-immunoreactive SGZ cells in both male and female mice,thereby showing a parallel response in both genders. 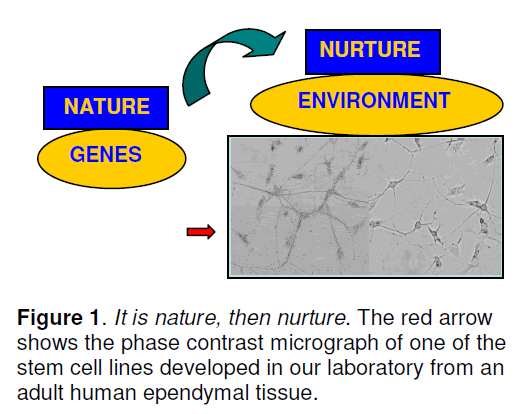 The environment (nurture) builds it through trillions of neuronal connections made by sight,smell,sound,touch and movement (Figure 1). Positivity enhances the connectivity,while negativity damages them. Figure 1.It is nature, then nurture. The red arrow shows the phase contrast micrograph of one of the stem cell lines developed in our laboratory from an adult human ependymal tissue. As we know that the brain undergoes different developmental stages which include neuronal proliferation,migration,differentiation,synaptogenesis and finally neural elaboration. At birth,the brain weighs about 1 pound (300gms) and has all the neurons that it will ever have. Also,these neurons do not regenerate. At birth,humans do not yet possess a fully operational brain. The environment affects how genes work; genes determine how the environment is interpreted. The development of brain assumes a well integrated manner over time. Learning is gradual. For instance,a baby doesn’t learn how to walk in one week. The brain is curious and seeks connections between the new and the known. The first five years of life are a crucial period for learning – a short but spectacular window of time when experiences such as a whisper,a hug and bedtime lullaby can change the architecture of the developing brain. Neural progenitors in regions such as the hippocampal subgranular zone and the subventricular zone are generally thought to represent resident populations of cells that are established at birth and maintained throughout life by a combination of symmetric and asymmetric cell divisions that both renew the progenitor population and generate daughter cells that adopt neuronal or glial fates. The designation of a cell as a “stem cell” implies both the capacity for self-renewal as well as multipotentiality,in the brain implying the ability to give rise to progeny with both neuronal and glial fates. Within the population of BrdU-labeled cells in the hippocampal subgranular zone,there is probably a population of true stem cells. However,since there are no markers that will differentiate whether an individual cell is a stem cell or has adopted a more restricted fate,BrdU-labeled cells in the subgranular zone are frequently referred by the more generic term “neural progenitor.” A peripheral origin would seem to constitute the only major alternative to the “resident since birth view.” Notably,neural progenitor cells in both the hippocampal subgranular zone and the subventricular zone exist in close proximity to blood vessels in what has come to be referred to as a vascular niche . Why neural progenitor cells reside in a vascular niche is unclear,although reasonable speculations include that blood vessels may condition the niche with factors that help neural progenitors maintain their proliferative and secreted by endothelial cells in maintaining neural stem cells in an undifferentiated state . However,a vascular niche might also imply that neural progenitor cells are derived from outside the central nervous system (CNS). Indeed,it is now well accepted that a circulating population of stem cells exists in adult blood and that at least under some in vitro conditions non-CNS stem cells may transdifferentiate into neurons . Whether transdifferentiation occurs in vivo is controversial and no studies to date have provided evidence that circulating stem cells repopulate the progenitor niches in the hippocampus and subventricular zone. If new neurons are generated in adult brain,what might their function be? An immediate question is,do the new granule cell neurons in the hippocampus make functional connections? Hippocampal granule neurons are part of a synaptic circuit that receives input from the entorhinal cortex and sends projections to the pyramidal neurons in the CA3 CA1 region of the hippocampus (Figure 2 ). If newly generated granule neurons are to participate functionally in these circuits,they must send axonal projections into the mossy fibers that carry granule cell output to the hippocampal pyramidal cells. Indeed,retrograde tracer studies using injections into the terminal fields of the mossy fibers have established that newly born BrdU-labeled neurons in the granule cell layer do send axonal projections to the pyramidal cell layers . Since the hippocampus is best known for its role in learning and memory,one immediate question is whether neurogenesis might facilitate hippocampaldependent learning. A general correlation does exist within inbred strains of mice between higher rates of neurogenesis in adult hippocampus and learning potential,as judged by the Morris water maze . To test this hypothesis experimentally Shors et al. abolished hippocampal neurogenesis by treating adult rats with the DNA-methylating agent methylazoxymethanol acetate (MAM). They then asked whether disrupting hippocampal neurogenesis would impair performance in a test in which an eye blink elicited by an electrical stimulus was conditioned to occur in response to a white noise. In one version of the test,known as “delayed conditioning,” the white noise and the periorbital stimulation (or unconditioned stimulus) overlaps temporally and learning does not require an intact hippocampus. In the second version,known as “trace conditioning,” a gap is present between the unconditioned and conditioned stimulus,and an intact hippocampus is required for leaning to occur. Interestingly,treatment with MAM impaired the hippocampal-dependent but not the hippocampalindependent leaning,arguing that hippocampal neurogenesis is involved in formation of trace memories. Figure 2.Anatomy of the hippocampal regions. Agents such as MAM are highly toxic and could be exhibiting effects on non-dividing cells,a confounding variable that is difficult to ever completely exclude. However,arguing against a general toxic effect of MAM,there was no change in hippocampal volume,cell numbers or long-term potentiation in the MAM-treated animals. In addition,if hippocampal neurogenesis was allowed to recover,leaning in the hippocampal-dependent task recovered as well. Most recent studies continue to support the notion that hippocampal neurogenesis plays a role in at least some forms of hippocampal learning and memory. Many factors affect hippocampal neurogenesis,including hormones,growth factors,drugs and neurotransmitters . Not only may hippocampal neurogenesis be required for some types of learning,but learning a task can also stimulate hippocampal neurogenesis . Environmental manipulations can also enhance hippocampal neurogenesis. For example,environmental enrichment which consists of switching animals from housing in standard laboratory cages to an environment with increased opportunities for social interaction,exploration and physical activity produces a range of morphological and behavioral changes in rodents including stimulating hippocampal neurogenesis . Physical exercise enhances hippocampal neurogenesis quite possibly by stimulating the systemic production of insulin-like growth factor 1 . Estrogen stimulates hippocampal neurogenesis and the rate of hippocampal neurogenesis is increased during phases of the estrus cycle when estrogen levels are high . Besides increasing longevity,dietary restriction also enhances hippocampal neurogenesis . Other factors suppress hippocampal neurogenesis. In general,glucocorticoids or any stimulus that activates the pituitary/adrenal axis suppresses hippocampal neurogenesis. Activation of the pituitary/ adrenal axis may at least partly account for the consistent effects of a variety of stress paradigms on suppressing hippocampal neurogenesis . Stress and pituitary/adrenal activation may also account for the suppression of hippocampal neurogenesis seen with social isolation  and lower social hierarchy in rodents in which hippocampal neurogenesis is decreased in subordinate males . Hippocampal neurogenesis also decreases with aging  and may be impaired in pathological states that provoke some types of inflammation . Several experimental set-ups have been designed to investigate the function of adult hippocampal neurogenesis in learning and memory. These include (1) low-dose irradiation of either whole brain or restricted brain regions [27,28]; (2) systemic treatment with antimitotic drugs,such as methylazoxymethanol acetate (MAM) ; (3) using aging as a natural process to reduce neurogenesis and (4) using genetically engineered mice to specifically eliminate neural progenitors,such as the GFAP-tk mice in which the proliferating GFAP+ progenitors are susceptible to ganciclovir treatment . Although none of these methods specifically targets adult progenitors,they begin to reveal a causal link between SGZ neurogenesis and cognition and suggest several potential roles for SGZ neurogenesis. The function of neurogenesis in learning was first examined by Shors and colleagues  in MAM-treated rats that failed to form conditioned responses in trace eyeblink conditioning or trace fear conditioning but not contextual fear conditioning,which are all hippocampus-dependent tasks. Similarly,no defect in contextual fear conditioning was detected in tlx conditional knockout mice,in which hippocampal neurogenesis was greatly reduced . In contrast,irradiated rats or mice and ganciclovir-treated GFAP-tk mice are defective in learning contextual fear conditioning tasks [29,32]. Besides the different cell ablation methods and confitioning protocols used in these studies,only very young cells were targeted by the MAM treatment,whereas both young cells and mature newborn neurons were affected in the irradiated animals and GFAP-tk mice. Therefore,it is possible that immature and mature newborn neurons play different roles in learning,given their distinct electrophysiological properties. The role of hippocampal neurogenesis in spatial learning and memory is rather elusive (reviewed in ). X-ray irradiation of 2-month-old mice leads to impaired spatial learning and memory in the Barnes maze but not in the Morris water maze . In contrast,X-ray irradiation of 3-week-old mice leads to opposite observations: impaired spatial learning and memory in the Morris water maze but not in the Barnes maze . Furthermore,many other studies were not able to detect any defects in spatial learning in animals with reduced or abolished neurogenesis [28,29,36-38],despite the fact that impaired long-term retention of memories was observed in irradiated rats and in tls mutant mice [28,31]. Inducible deletion of tlx in adult mice also led to deective learning in the Morris water maze. Intriguily,ablation of hippocampal neurogenesis even caused an improvement in hippocampusdependent working memory in the eight-armed radial maze ,suggesting that adult-born neurons may have distince roles in the formation of different types of memories. In general,neurogenesis is stimulated by injuries to the hippocampus. Insults including ischemia ,seizures  and direct excitotoxic lesioning of the hippocampal granule cell layer  all increase neural progenitor proliferation. Lesioning the hippocampus indirectly by removing its afferent input from the entorhinal cortex also stimulates neurogenesis . Injury may also stimulate neurogenesis outside the hippocampus. Occlusion of the middle cerebral artery in rats,for example,in addition to enhancing hippocampal neurogenesis,induces neural progenitors in the subventricular zone to migrate into the cerebral cortex and striatum . What remains unclear is the degree to which such activation results in actual repair and the reestablishment of functional connections. While the answer to this question is not fully known,targeted injuries to select neocortical layers in mice has been shown to stimulate the appearance of BrdU-labeled cells within the neocortex ,reflecting cell labelling induced within the neocortex itself as well as migration of BrdU-labeled cells from the subventricular zone . Some of these labeled cells differentiate into neurons and,most interestingly,some fractions of them send projections to the thalamus and reestablish corticothalamic projections. While these studies do not establish full functionality,they do offer hope that following brain injuries more plasticity exists in adult brain than might have been expected and that the capacity exists to reestablish functional connections between brain regions. Hippocampal neurogenesis might at first be thought to have little relevance to major affective disorders. Yet recently,much attention has been focused on hippocampal neurogenesis in relation to the pathophysiology and treatment of mood disorders. Interest was initially stimulated by the observation that all major pharmacological and nonpharmacological treatments for depression enhance hippocampal neurogenesis . One among them includes ‘Psychotherapy’,which,in the modern medical era is gaining significance as an adjuvant therapy in various psychiatric and neuropsychiatric disorders. Therapeutic hypnosis in the current times can be extended to have an effect on activity-dependent gene expression,neurogenesis,and stem cells in memory,learning,behaviour change,and healing. Ross  speculated that therapeutic and post-hypnotic suggestion could be focused more precisely with the time parameters of gene expression and neurogenesis that range from minutes and hours for synthesizing new synapses to weeks and months for the generation and maturation of new,functioning neurons in the adult brain. On the other hand,Ranson  tracked back the monoaminergic hypothesis involving the role of serotoninergic and noradrenergic role in the pathophysiology of depression. The signal transduction of transcription and growth factors (CREB and BDNF) have been given prime importance in the chronic stress and neurogenesis process. expression leads to an up-regulation of specific target genes,including the neurotrophin BDNF. Chronic antidepressant treatments enhance BDNF expression within hippocampal and cortical neurons and can prevent the stress-induced decrease in BDNF expression. Thus,he proposed the information processing hypothesis,which provides strong support to the use of combined treatment strategies,associating psychotherapy and pharmacological approaches in the case of severe depression in patients with cancer. Indeed,clinically effective agents including selective serotonin reuptake inhibitors (SSRIs),selective norepinephrine reuptake inhibitors (SNRIs),tricyclics,lithium,and monoamine oxidase (MAO) inhibitors enhance hippocampal neurogenesis . Similar effects are also seen with newer agents predicted to have antidepressant efficacy,including rolipram (a type IV phosphodiesterase inhibitor),substance P (NK1 receptor) antagonists,group II metabotropic glutamate receptor antagonists and AMPA (a-amino-5- hydroxy-3-methyl-4-isoxazole propionic acid) receptor potentiators. The effects are specific in that non-antidepressant agents,such as haloperidol,do not consistently enhance hippocampal neurogenesis. Interestingly,the time course of the effects that agents such as fluoxetine have on neurogenesis are delayed in a manner consistent with the known delay in the clinical efficacy of the drugs. Nonpharmacological manipulations such as electroconvulsive shock therapy (ECT) also increase neural progenitor proliferation and neurogenesis. Indeed,of all antidepressant treatments tested to date,only one putative therapy,transcranial magnetic stimulation,may not affect hippocampal neurogenesis . In major depression,it has been hypothesized that neuronal systems may be unable to respond to stressful stimuli with appropriate adaptive plasticity . Neurogenesis may be seen as one form of adaptive plasticity. Various acute and chronic physical or psychosocial stress paradigms all reduce neural progenitor proliferation and neurogenesis in the hippocampus of adult animals [50,51]. Stressinduced reductions in neural progenitor proliferation in the hippocampus can also be reversed with antidepressant treatments including tricyclics,SSRIs and NK1 receptor antagonists [50,52,53]. These effects have been seen in models of psychosocial stress  and learned helplessness . Thus,one current working hypothesis is that reduced neural progenitor proliferation leads to decreased hippocampal neurogenesis and that reversing or blocking this decrease may be one way that antidepressant treatments exert therapeutic effects. Admittedly,it was well known before the effects of antidepressants on neurogenesis were discovered that stress adversely affects the hippocampus in other ways,including producing atrophy and reduced dendritic arborization of CA3 pyramidal neurons ,and that some of these effects can be reversed by antidepressants . Indeed,the degree to which effects on hippocampal neurogenesis underlie the therapeutic benefits of antidepressant treatments remains to be determined and several recent commentaries have summarized arguments,both pro and con,on this issue [55-57]. However,recent studies by Santarelli et al. in mice seem to strongly support the notion that hippocampal neurogenesis plays some role in the actions of antidepressant compounds. In these studies,hippocampal neurogenesis was blocked with fractionated radiation directed to the hippocampus. Mice were then tested in an antidepressant- sensitive behavioral test called the noveltysuppressed feeding test,in which following fasting; the time that it takes for a mouse to eat in a novel environment is measured. The test is considered a measure of anxiety since anxiolytic drugs reduce feeding latency. It is also considered a measure of antidepressant effect since commonly used antidepressant compounds have a similar effect. Reducing neural progenitor proliferation blocked the responses of mice to both fluoxetine and imipramine in the novelty-suppressed feeding test,arguing that hippocampal neurogenesis is necessary for the actions of antidepressants in this test. As with cytotoxic agents,interpretation of such studies is confounded by whether radiation may be affecting factors other than hippocampal neurogenesis since in these studies other regions including the hypothalamus and amygdala,which might also be involved in mediating antidepressant effects,were included in the irradiated area. While such effects are difficult to completely exclude,no changes were found in brain histology,numbers of granule cell neurons or hippocampal long-term potentiation. A variety of neuroendocrine responses were also normal and a separate behavioural test,the cued fear conditioning test,which is regarded as a test of amygdala function,were in intact. Collectively,these studies strongly argue that at least some of the effects of antidepressants are mediated through their influence on hippocampal neurogenesis. How antidepressants exert their actions is not completely understood. At the cellular level,antidepressants seem to principally increase the proliferation rate of neural progenitors without affecting fractional survival rate or the rate at which surviving cells differentiate into neurons . BDNF (brain-derived neurotrophic factor) has been postulated to play a significant role in this action as explained below. Thus antidepressants probably enhance neurogenesis by increasing the size of the progenitor pool. Although effects have been principally studied in vivo,fluoxetine  and lithium  have been noted to increase cell proliferation in vitro as well. At the molecular level it is not known how antidepressants influence neural progenitor proliferation. As noted above,stress adversely affects hippocampal function at least in part through hyperactivity of the pituitary/adrenal axis and hypersecretion of glucocorticoids . A connection between activity of the glucocorticoid system and excitatory amino acids has been suggested by the finding that cortisol-induced decreases in neural progenitor proliferation can be prevented by administration of the N-methyl- D-aspartate (NMDA) antagonist MK-801 . Glucocorticoid activity is mediated by high-affinity mineralocorticoid and lowaffinity glucocorticoid receptors and hippocampal cells are rich in glucocorticoid receptors where they regulate excitability and morphology. Also,elevated glucocorticoid levels suppress hippocampal neurogenesis in adults. This was shown by Quiros et al  who studied the ability of melatonin to prevent glucocorticoid-induced cell death in hippocampal HT22 cells,found a G(1) cell cycle arrest mediated by an increase of cyclin/cyclindependent kinase inhibitor p21(WAF1/CIP1) protein after dexamethasone treatment and incremental change in amyloid beta protein and glutamate toxicity. Antidepressants affect additional pathways that may be relevant to their effects on hippocampal neurogenesis,the best studied of these being the interactions of antidepressants with the BDNF signalling pathway . Monteggia et al  reported that deleting BDNF in a knock-out model in broad forebrain regions of adult mice impairs hippocampal-dependent learning and long-term potentiation and also attenuating the actions of desipramine,an antidepressant,in the forced swim test,suggesting the involvement of BDNF in antidepressant efficacy. Similar experiments conducted recently by Adachi et al  showed the selective loss of BDNF in the DG but not the CA1 region attenuates the actions of desipramine and citalopram in the forced swim test. They used a combination of adeno-associated virus (AAV) with the Cre/loxP site-specific recombination system to induce the knockout of BDNF selectively in either the CA1 or dentate gyrus (DG) subregions of the hippocampus. Their results supported the view that BDNF in the DG might be essential in mediating the therapeutic effect of antidepressants. BDNF is of interest since both BDNF mRNA and protein increase in response to antidepressant treatments and BDNF is one of a number of growth factors that enhance hippocampal neurogenesis. BDNF administered exogenously to brain either intraventricularly or intrahippocampal mimics the effects of antidepressants in a number of behavioral models of depression. Stress also downregulates BDNF levels and antidepressants reverse this effect. Thus,by impacting both the glucocorticoid and BDNF pathways,antidepressants intersect with two major pathways that also regulate hippocampal neurogenesis. That these are the only pathways,however,seems unlikely: indeed,recent microarray and proteomic studies of antidepressant-treated animals have identified several other potential targets for antidepressant actions that might also impact hippocampal neurogenesis [65,66] such as subgenual prefrontal cortex,dorsal raphe nucleus and hypothalamus . An interesting,but as yet unproven,hypothesis concerning the role of hippocampal neurogenesis in human depression has been proposed. Jacobs et al. and later others suggested that insufficient hippocampal neurogenesis causally underlies depression [68,69]. Besides,hippocampal volume (antemortem as well as post mortem) has been utilized as a marker of cognitive deficits in certain neuropsychiatric (e.g.,schizophrenia) and neurodegenerative disorders (e.g.,Alzheimer’s disease). The trisynaptic circuitry consisting between the mossy fibers,the axons of hippocampal dentate granular cells,and the dendrites of CA3 pyramidal neurons is important in integrating various cognitive processes. In Schizophrenia,the derangement of this circuit leads to higher cognitive function deficits and spatial learning and memory disturbances. Kolomeets et al. proved that the synaptic contacts between mossy fiber axon terminals (MFT) and branched dendritic spines of pyramidal neurons in stratum lucidum of the CA3 region of the hippocampus had a significantly reduced volume fraction of spines,total number of invaginated spines,and number of spines forming synapses per MFT using electron microscopy morphometric study. However,there were no effects of postmortem delay,age,duration of disease,or neuroleptic exposure found,suggesting a link to those with predominantly positive symptoms. In Alzheimer’s disease,the hippocampal volume in the antemortem subjects has been evaluated using magnetic resonance imaging,correlating with the dementia severity and the density of hippocampal neurofibrillary tangles at autopsy . However,it is relatively difficult to know the correlation between the two measures. Consistent with the hypothesis of Jacobs et al.,stress related glucocorticoids are associated with a decrease in neurogenesis,and increased serotonin levels are associated with an increase in neurogenesis [72,73]. If adult neurogenesis is blocked by irradiation,the behavioral effects of fluoxetine treatment (a serotonin reuptake inhibitor) have been found to be abolished . Besides,a recent report has demonstrated that the behavioural effects and increased SGZ cell proliferation in resonse to fluoxetine are dependent on the genetic composition of the mice . Unlike fluoxetine,the antidepressant -like effects of a melanin-concentrating hormone receptor antagonist are independent of SGZ neurogenesis. This is evident in BALB/cJ mice,wherein the behavioral effect of fluoxetine is dependent on SGZ neurogenesis in chronic unpredictable stress but nor in the forced swimming test or in noveltyinduced hypophagia. In addition,the antidepressant- like effect of the enriched environment in one study was found to be independent of SGZ neurogenesis. Thus,different antidepressants may act through different mechanisms and SGZ neurogenesis may be one of the many substrates of certain antidepressants,the apparently conflicting observations may also result from the choice of behavioral tests. Thus,despite all the progress in the field,it remains unclear whether impaired SGZ neurogenesis is an etiological factor for depression. In fact,SGZ neurogenesis and depression-like behavior are not well correlated in at least two rodent models of depression,learned helplessness and chronic mild stress . Moreover,ablating neurogenesis does not affect the anxiety-related or depressed-like behavior in a battery of tests of anxiety and depression [27,30]. Thus,it is unclear whether SGZ neurogenesis plays a role in baseline anxiety in rodents. Finally,despite the fact that hippocampus atrophy is often detected in depressed patients,whether and to what extent the reduction in SGZ neurogenesis contributes to this atrophy has not been directly investigated. Therefore,further studies are needed to test whether impaired SGZ neurogenesis is a pivotal component for the pathophysiology of depression. Besides,the hippocampus is generally thought to be involved in memory consolidation,and less involved in the generation of mood,suggesting that altered hippocampal neurogenesis may be secondary to,rather than causative of depression. For example,disturbed adult neurogenesis in depression might be only one aspect of a more general failure of neural plasticity . Additionally and importantly,adult hippocampal neurogenesis is limited to the dentate gyrus sub-region and does not occur throughout the hippocampus,so interpretations drawn from more global hippocampal changes in disease states should be considered with caution. Although these functional studies suggest some potential roles for SGZ neurogenesis in cognition,it is difficult to reach any definitive conclusions due to the controversial results. These discrepancies are probably due to differences in animal species and strains,the details behavioral procedures and the different knockdown strategies. More significantly,all the available strategies rely on the global treatment of animals and may cause a variety of undesired side effects. Furthermore,all current studies have employed behavioral tasks based on lesion models where the whole hippocampus is affected. Given that new neurons in the SGZ constitute only a small part of the anatomical structure of the hippocampus,impaired behavior caused by a lack of neurogenesis will be easier to detect if the behavioral tests are aimed at challenging these new neurons. Therefore,to definitively demonstrate the functions of SGZ neurogenesis,selective ablation approaches with few side effects and a variety of behavioral tasks need to be developed in the future. Here,we will discuss SGZ neurogenesis in cases of epipelsy,and neurodegenerative diseases (eg.,Alzheimer’s disease,Parkinson’s disease) and CNS infections ( eg.,HIV). Seizure activity increases proliferation in both SVZ and SGZ,but most studies focus on exxaming the SGZ because epilepsy causes cognitive defects (reviewed by Jessberger and Parent ). Neurogenesis in the SGZ can be elevated for up to 5weeks after seizure but eventually declines to the basal or even a lower level. Seizure induces the proliferation of both progenitors and neuroblasts,which is unlikely to be a compensatory effect in response to neuronal death. Seizure causes abnormal morphogenesis in newborn neurons,such as hilar basal dendrite formation and Ectopic hilar migration of newborn neurons. Seizure activity also leads to mossy fiber sprouting of neurons born prior to seizure activity [77,78]. Seizure-induced new neurons functionally integrate into the hippocampal circuitry despite their abnormal connectivity. Interestingly,the antiepileptic drug Valproic acid can inhibit seizure-induced neurogenesis and also protect rats from seizureassociated deficiency in a hippocampus-dependent learning task. However,the level of SGZ neurogenesis does not always correlate with susceptibility to developing epilepsy. The role of seizure-associated aberrant neurogenesis in epilepsy is yet tobe determined. Alzheimer’s disease (AD) is a degenerative disorder of the brain characterized clinically by progressive loss of memory and other cognitive skills. Its pathological hallmarks include neuronal and synaptic loss,amyloid plaques,and neurofibrillary tangles. While most cases occur sporadically,the disease is inherited in some families in an autosomal dominant fashion. These familial AD (FAD) cases share the identical clinical and pathological features as sporadic AD except for their generally earlier age of onset . Mutations in the amyloid precursor protein as well as the presenilin genes have been found to cause early onset FAD . Several studies have found that neurogenesis is impaired in the hippocampus of transgenic mice expressing presenilin 1 FAD mutants [80-82]. Decreased progenitor proliferation has also been noted in mice expressing FAD mutations in the amyloid precursor protein . The molecular basis for this impairment is unknown,although Ab peptide,which is overproduced in FAD mutant brain and is the principle component of senile plaques,may be directly toxic to neural progenitor cells . At the cellular level,the presenilin-1 FAD mutants seem to primarily reduce the fractional survival of BrdUlabeled neural progenitors without decreasing total granule cell numbers,suggesting that the FAD mutant’s primary effect is to alter the kinetics of new neuron production,in essence making the hippocampus in the FAD mutant generate more neural progenitors in order to maintain the same number of granule cell neurons . Whether a similar impairment occurs in human FAD cases or in the more common sporadic disease is not known. One study has reported that the number of neurons expressing immature neuronal markers such as doublecortin,polysaturated nerve cell adhesion molecule (PSA-NCAM) and TUC-4 (TOAD [Turned On After Division]/Ulip/CRMP) are increased in the hippocampal granule cell layer of sporadic human cases . The authors of this study interpreted their findings as indicating that neurogenesis was increased in the hippocampus in Alzheimer’s disease. However,given the lack of any method for tracking the fate of these immature neurons and,in particular,whether they ever progress to become mature neurons,these results could also be interpreted as showing that in AD hippocampal neurogenesis is blocked at the stage of immature neuron generation. Of direct clinical relevance is whether impaired neurogenesis might contribute to cognitive dysfunction in AD. Pointing to a possibly relevant role,the hippocampus is pathologically affected early in AD with pyramidal cell loss and disruption of perforating path connections from the entorhinal cortex. Granule cell neurons exhibit cytoskeletal changes that are similar to those found in other neurons in AD,possibly impairing neurogenesis. It is also interesting that the rate of hippocampal neurogenesis decreases with aging coincident with age-related memory decline  and that age related memory impairments may be improved in rodents following transplantation of immortalized neural stem cells into brain . Moreover,factors that positively affect hippocampal neurogenesis,such as estrogen ,and cognitively stimulating activities  may reduce the risk of AD. Yet of the major brain regions ultimately affected by AD pathology,only the hippocampus is currently regarded as neurogenic,and even in the hippocampus,the brunt of the pathology is in the pyramidal neurons,which are currently regarded as non-neurogenic. Thus,whether hippocampal neurogenesis can be considered a legitimate therapeutic target in AD is at present unclear. Parkinson's disease,as we know is a neurodegenerative disorder characterized by a progressive neuronal loss affecting preferentially the dopaminergic neurons of the nigrostriatal projection. Hope rests upon the development of effective neurorestorative or neuroregenerative therapies based on gene and stem cell therapy or a combination of both. Recent years have provided evidence for the existence of neural stem cells with the potential to produce new neurons,particularly of a dopaminergic phenotype,in the adult mammalian brain. Such stem cells have been identified in so called neurogenic brain areas,where neurogenesis is constitutively ongoing,but also in primarily nonneurogenic areas,such as the midbrain and the striatum,where neurogenesis does not occur under normal physiological conditions . Endogenous neural stem cells may have the potential to be instrumentalized for a non-invasive cell replacement therapy with autologous neurons to repair the damaged nigrostriatal dopaminergic projection. The results of experimental therapies based on transplanting exogenous dopamine-rich fetal cells or growth factor (GDNF) overexpression into the brain of Parkinson's disease patients encourage future cell- and gene-based strategies. However,one has to investigate the possible impact of PD on adult neuronal stem cell pools and their neurogenic potential,before designing effective therapeutic potentials . It is not clear how the HIV infection of the brain produces various behavioural deficits and diverse neuropathological signs. Tran and Miller  suggested that SDF-1/CXCR4 (Stromal cell-derived factor-1/ chemokine receptor CXCR4) signaling is crucial in the adult neurogenesis. The chemokine SDF-1 via its receptor CXCR4 is also essential for embryonal development of the dentate gyrus as shown by them. Adult neural progenitor cells existing in the subgranlar zone,that produce granule neurons,express CXCR4 and other chemokine receptors,and granule neurons express SDF-1. Here,they showed that the virus may interfere with SDF-1/CXCR4 signaling in the brain including disruption of SGZ neurogenesis. Recently,Kitayama et al  have shown that the neurotoxic factor(s) released from HIV-1- infected macrophages impede(s) neuronal cell repair in brain tissue,especially the hippocampus,making it more vulnerable to neuronal damage. They cocultured rat OHCs (outer hair cells) with HIV-1-infected MDM (Monocyte-derived macrophages) and found that neuronal cells at the GCL of the DG were preferentially killed via apoptosis,and that projection of MF (mossy fibre) from GCL to PCL of the CA3 region was severely disturbed. Then,they marked the precursor cells around the DG region by using an EGFP-expressing retrovirus vector and found that these cells lost the ability to differentiate into neurons when exposed to HIV-1-infected MDM. In the DG,new neurons are normally incorporated into GCL or PCL,while in the presence of HIV-1-infected MDM,mature neurons failed to be incorporated into those layers. From a more fundamental neuroscience point of view,it is important to learn about the normal role of precursor cells and the normal function of neurogenesis in the neurogenic regions of the adult CNS. This information might have immense implications for our understanding of brain function in development,normal adulthood,and disease states. Circuit plasticity at the level of individual cells,neuronal or glial,adds a new layer of complexity to our understanding of how brain structure and function interact. Better understanding of these issues may enable the prevention of disease and dysfunction beyond the already evident goals of trying to repair what is already degenerating or damaged. Such protection of normal brain function may offer important therapeutic options complementary to those possible by cellular repair. Indeed,maintaining cellular plasticity might be one of the most straightforward concepts in neuroprotection. The potential mechanisms for restoration of any biological manipulation will depend in part on the strategies employed to optimally induce activity in neuronal circuits. Despite efforts to analyze the function of hippocampal neurogenesis,the precise role it plays in cognitive or emotional behaviors is still requires further exploration. However,this field is just at the beginning of understanding the complex interplay between neural precursors’ potential and signals in their local microenvironment; much can be learned about precursor heterogeneity and how to take advantage of what might be partial cell-type restriction,permissive and instructive developmental signals,and modulation of specific aspects of neuronal differentiation and survival. Progress over the past decade has been great,and the coming decades promise to offer significant insight into these and other critical issues for the field. Deciphering the intricate pathways of neurogenesis will certainly help us to design effective therapeutic strategies for various neurological diseases in humans. Alvarez-Buylla A,Seri B,Doetsch F. (2002) Identification of neural stem cells in the adult vertebrate brain. Brain Res Bull 57: 751-758. Cayre M,Malaterre J,Scotto-Lomassese S,et al. (2002) The common properties of neurogenesis in the adult brain: from invertebrates to vertebrates. Comp Biochem Physiol B Biochem Mol Biol 132: 1-15. Gage FH. (2000) Mammalian neural stem cells. Science 287: 1433-1438. Nottebohm F. (2002) Neuronal replacement in adult brain. Brain Res Bull 57: 737-749. Bennette,E.L.,Diamond,M.C.,Krech,D.,et al. (1964). Chemical and Anatomical Plasticity of Brain. Science 164: 610-619. Diamond,M.C.,Krech,D.,Rosenzweig,M.R. (1964). The effects of an Enriched Environment on the Rat Cerebral Cortex,J.Comp. Neurol. 123: 111-119. Matsumoto Y,Osumi N (2008) The role of Pax6 in the developing central nervous system,Brain Nerve. 60(4): 365-74. Takács J,Zaninetti R,Víg J,et al. (2007) Postnatal expression pattern of doublecortin (DCX) in some areas of the developing brain of mouse,Ideggyogy Sz. 60(3-4): 144-7. Lagace DC,Fischer SJ,Eisch AJ,(2007) Gender and endogenous levels of estradiol do not influence adult hippocampal neurogenesis in mice,Hippocampus 17(3): 175-80. Alvarez-Buylla A,Lim DA. (2004) For the long run: maintaining germinal niches in the adult brain. Neuron 41(5): 683-686. Shen Q,Goderie SK,Jin L,et al. (2004) Endothelial cells stimulate self-renewal and expand neurogenesis of neural stem cells. Science 304(5675): 1338-1340. Ortiz-Gonzalez XR,Keene CD,Verfaillie CM,et al. (2004) Neural induction of adult bone marrow and umbilical cord stem cells. Curr Neurovasc Res. 1(3): 207-213. Hastings NB,Gould E. (1999) Rapid extension of axons into the CA3 region by adult-generated granule cells. J Comp Neurol. 413(1): 146-154. Kempermann G,Gage FH. (2002) Genetic determinants of adult hippocampal neurogenesis correlate with acquisition,but not probe trial performance,in the water maze task. Eur J Neurosci. 16(1): 129-136. Shors TJ,Miesegaes G,Beylin A,et al. (2001) Neurogenesis in the adult is involved in the formation of trace memories. Nature 410(6826): 372-376. Ming GL,Song H. (2005) Adult neurogenesis in the mammalian central nervous system. Annu Rev Neurosci. 28: 223-250. Gould E,Beylin A,Tanapat P,et al. (1999) Learning enhances adult neurogenesis in the hippocampal formation. Nat Neurosci. 2(3): 260-265.
van Praag H,Kempermann G,Gage FH. (2000) Neural consequences of environmental enrichment. Nat Rev Neurosci. 1(3): 191-198. Carro E,Nunez A,Busiguina S,et al. (2000) Circulating insulin-like growth factor I mediates effects of exercise on the brain. J Neurosci. 20(8): 2926- 2933. Tanapat P,Hastings NB,Reeves AJ,et al. (1999) Estrogen stimulates a transient increase in the number of new neurons in the dentate gyrus of the adult female rat. J Neurosci. 19(14): 5792-5801. Lee J,Seroogy KB,Mattson MP. (2002) Dietary restriction enhances neurotrophin expression and neurogenesis in the hippocampus of adult mice. J Neurochem 80(3): 539-547. Gould E,Tanapat P. (1999) Stress and hippocampal neurogenesis. Biol Psychiatry 46(11): 1472-1479. Lu L,Bao G,Chen H,et al. (2003) Modification of hippocampal neurogenesis and neuroplasticity by social environments. Exp Neurol. 183(2): 600-609. Kozorovitskiy Y,Gould E. (2004) Dominance hierarchy influences adult neurogenesis in the dentate gyrus. J Neurosci. 24(30): 6755-6759. Kuhn HG,Dickinson-Anson H,Gage FH. (1996) Neurogenesis in the dentate gyrus of the adult rat: age-related decrease of neuronal progenitor proliferation. J Neurosci. 16(6): 2027-2033. Monje ML,Toda H,Palmer TD. (2003) Inflammatory blockade restores adult hippocampal neurogenesis. Science 302(5651): 1760-1765. Santarelli,L.,Saxe,M.,Gross,C.,et al. (2003) Requirement of hippocampal neurogenesis for the behavioural effects of antidepressants. Science 301: 805-809. Snyder J.S.,Hong,N.S.,McDonald,R.J.,et al. (2005) A role for adult neurogenesis in spatial long-term memory. Neuroscience 130: 843-852. Shors,T.J.,Miesegaes,G.,Beylin,A.,et al. (2001) Neurogenesis in the adult is involved in the formation of trace memories. Nature 410: 372-376. Saxe,M.D.,Battaglia,F.,Wang,J.W.,et al. (2006) Ablation of hippocampal neurogenesis impairs contextual fear conditioning and synaptic plasticity in the dentate gyrus. Proc.Natl.Acad.Sci.USA 103: 17501-17506. Zhang,C.L.,Zou,Y.,He,W.,et al. (2008) A role for adult TLX-positive neural stem cells in learning and behaviour. Nature 451(7181): 1004-7. Winocur,G.,Wojtowicz,J.M.,Sekeres,M.,et al. (2006) Inhibition of neurogenesis interferes with hippocampus-dependent memory function. Hippocampus 16: 296-3304. Leuner,B.,Gould,E.,and Shors,T.J. (2006) Is there a link between adult neurogenesis and learning? Hippocampus 16: 216-224. Raber,J.,Rola,R.,LeFevour,A.,et al. (2004) Radiation-induced conginitive impairments are associated with changes in indicatiors of hippocampal neurogenesis. Radiat. Res. 162: 39-47. Rola,R.,Raber,J.,Rizk,A.,et al. (2004) Radiationinduced impairment of hippocampal neurogenesis is acssociated with cognitive deficits in young mice. Exp.Neurol.188: 316-330. Madsen,T.M.,Kristjansen,P.E.,Bolwig,T.G.,et al. (2003) Arrested neuronal proliferation and impaired hippocampal function following fractionated brain irradiation in the adult rat. Neuroscience 119: 635- 642. Meshi,D.,Drew,M.R.,Saxe,M.,et al. (2006) Hippocampal neurogenesis is not required for behavioral effects of environment enrichment. Nat. Neuroscience 9: 729-731. Shors,T.J.,Townsend,D.A.,Zhao,M.,et al. (2002) Neurogenesis may relate to some but not all types of hippocampal-dependent learning. Hippocampus 12: 578-584. Saxe,M.D.,Malleret,G.,Vronskaya,S.,et al. (2007) Paradoxical influence of hippocampal neurogenesis on working memory. Proc. Natl. Acad. Sci. USA 104: 4642-4646. Liu J,Solway K,Messing RO,et al (1998) Increased neurogenesis in the dentate gyrus after transient global ischemia in gerbils. J Neurosci. 18(19): 7768- 7778. Parent JM,Yu TW,Leibowitz RT,et al. (1997) Dentate granule cell neurogenesis is increased by seizures and contributes to aberrant network reorganization in the adult rat hippocampus. J Neurosci. 17(10): 3727-3738. Gould E,Tanapat P. (1997) Lesion-induced proliferation of neuronal progenitors in the dentate gyrus of the adult rat. Neuroscience 80(2): 427-436. Gama Sosa MA,Wen PH,De Gasperi R,et al. (2004) Entorhinal cortex lesioning promotes neurogenesis in the hippocampus of adult mice. Neuroscience 127(4): 881-891. Jin K,Sun Y,Xie L,et al. (2003) Directed migration of neuronal precursors into the ischemic cerebral cortex and striatum. Mol Cell Neurosci. 24(1): 171-189. Magavi SS,Leavitt BR,Macklis JD. (2000) Induction of neurogenesis in the neocortex of adult mice. Nature 405(6789): 951-955. Malberg JE. (2004) Implications of adult hippocampal neurogenesis in antidepressant action. J Psychiatry Neurosci. 29(3): 196-205. Ross EL. (2003) Gene expression,neurogenesis,and healing: psychosocial genomics of therapeutic hypnosis,Am J Clin Hypn. 45(3): 197-216. Ranson A. (2007) Neurotrophic theories of stress and neurobiology of antidepressants: applications in psycho-oncology. Bull Cancer 94(5): 431-8. Vaidya VA,Duman RS. (2001) Depression-emerging insights from neurobiology. Br Med Bull. 57: 61-79. Malberg JE,Duman RS. (2003) Cell proliferation in adult hippocampus is decreased by inescapable stress: reversal by fluoxetine treatment. Neuropsychopharmacology 28(9): 1562-1571. Pham K,Nacher J,Hof PR,et al. (2003) Repeated restraint stress suppresses neurogenesis and induces biphasic PSANCAM expression in the adult rat dentate gyrus. Eur J Neurosci. 17(4): 879-886. Czeh B,Michaelis T,Watanabe T,et al. (2001) Stress-induced changes in cerebral metabolites,hippocampal volume,and cell proliferation are prevented by antidepressant treatment with tianeptine. Proc Natl Acad Sci USA. 98(22): 12796-12801.
van der Hart MG,Czeh B,de Biurrun G,et al. (2002) Substance P receptor antagonist and clomipramine prevent stress-induced alterations in cerebral metabolites,cytogenesis in the dentate gyrus and hippocampal volume. Mol Psychiatry 7(9): 933-941. McEwen BS,Magarinos A.M. (2001) Stress and hippocampal plasticity: implications for the pathophysiology of affective disorders. Hum Psychopharmacol 16(S1): S7-S19. Duman RS. (2004) Depression: a case of neuronal life and death? Biol Psychiatry 56(3): 140-145. Henn FA,Vollmayr B. (2004) Neurogenesis and depression: etiology or epiphenomenon? Biol Psychiatry 56(3): 146-150. Sapolsky RM. (2004) Is impaired neurogenesis relevant to the affective symptoms of depression? Biol Psychiatry 56(3): 137-139. Manev H,Uz T,Smalheiser NR,et al. (2001) Antidepressants alter cell proliferation in the adult brain in vivo and in neural cultures in vitro. Eur J Pharmacol 411(1-2): 67-70. Kim JS,Chang MY,Yu IT,et al. (2004) Lithium selectively increases neuronal differentiation of hippocampal neural progenitor cells both in vitro and in vivo. J Neurochem 89(2): 324-336. McEwen BS. (2001) Plasticity of the hippocampus: adaptation to chronic stress and allostatic load. Ann N Y Acad Sci. 933: 265-277. Quiros I,Mayo JC,Garcia-Suarez O,et al. (2008) Melatonin prevents glucocorticoid inhibition of cell proliferation and toxicity in hippocampal cells by reducing glucocorticoid receptor nuclear translocation. J Steroid Biochem Mol Biol. 110(1-2): 116-24. Duman RS. (2004) Role of neurotrophic factors in the etiology and treatment of mood disorders. Neuromolecular Med. 5(1): 11-25. Monteggia LM,Barrot M,Powell CM,et al. (2004) Essential role of brain-derived neurotrophic factor in adult hippocampal function. Proc Natl Acad Sci USA. 101(29): 10827-32. Adachi M,Barrot M,Autry AE,et al. (2008) Selective loss of brain-derived neurotrophic factor in the dentate gyrus attenuates antidepressant efficacy. Biol Psychiatry. 63(7): 642-9. Drigues N,Poltyrev T,Bejar C,et al. (2003) cDNA gene expression profile of rat hippocampus after chronic treatment with antidepressant drugs. J Neural Transm 110(12): 1413-1436. Khawaja X,Xu J,Liang JJ,et al. (2004) Proteomic analysis of protein changes developing in rat hippocampus after chronic antidepressant treatment: implications for depressive disorders and future therapies. J Neurosci Res. 75(4): 451-460. Rajkowska G. (2000) Postmortem studies in mood disorders indicate altered numbers of neurons and glial cells. Biol Psychiatry 48: 766-777. Jacobs,B.L.,Praag,H.,Gage,F.H. (2000) Adult brain neurogenesis and psychiatry: a novel theory of depression. Mol. Psychiatry 5: 262-269. D’Sa,C.,Duman,R.S. (2002) Antidepressants and neuroplasticity. Bipolar Disord. 4: 183-194. Kolomeets NS,Orlovskaya DD,Rachmanova VI,et al. (2005) Ultrastructural alterations in hippocampal mossy fiber synapses in schizophrenia: a postmortem morphometric study,Synapse 57(1):47-55. Csernansky JG,Hamstra J,Wang L,et al. (2004) Correlations between antemortem hippocampal volume and postmortem neuropathology in AD subjects,Alzheimer Dis Assoc Disord. 18(4): 190-5. Brezun,J.M.,Daszuta,A. (1999) Depletion in serotonin decreases neurogenesis in the dentate gyrus and the subventricular zone of adult rats. Neuroscience 89: 999-1002. Herrlinger,U.,Woiciechowski,C.,Sena-Esteves,M.,et al. (2000) Neural precursor cells for delivery of replication-conditional HSV-1 vectors to intracerebral gliomas. Mol. Ther. 1: 347-357. Warner-Schmidt,J.L.,Duman,R.S. (2007) VEGF is an essential mediator of the neurogenic and behavioral actions of antidepressant treatment. Hippocampus 16: 239-249. Kempermann,G.,Kronenberg,G.,(2003) Depressed new neurons–adult hippocampal neurogenesis and a cellular plasticity hypothesis of major depression. Biol. Psychiatry 54: 499-503. Jessberger,S.,Parent,J.M. (2007) Epilepsy and Adult Neurogenesis. In Adult Neurogenesis,F.H.Gage,G.Kempermann and H.Song,eds. (Cold Spring Harbor,NY: Cold Spring Harbor Laboratory Press),pp.535-547. Walter,C.,Murphy,B.L.,Pun,R.Y.,et al. (2007) Pilocarpine-induced seizures cause selective timedependent changes to adult-generated hippocampal dentate granule cells. J.Neuroscience 27: 7541-7552. Selkoe DJ. (2001) Alzheimer’s disease: genes,proteins,and therapy. Physiol Rev 81(2): 741-766. Wen PH,Hof PR,Chen X,et al. (2004) The presenilin-1 familial Alzheimer’s disease mutant P117L impairs neurogenesis in the hippocampus of adult mice. Exp Neurol. 188: 224-237. Wang R,Dineley KT,Sweatt JD,et al. (2004) Presenilin 1 familial Alzheimer’s disease mutation leads to defective associative learning and impaired adult neurogenesis. Neuroscience. 126(2): 305-312. Chevallier NL,Soriano S,Kang DE,et al. (2005) Perturbed neurogenesis in the adult hippocampus associated with presenilin-1 A246E mutation. Am J Pathol. 167(1): 151-159. Dong H,Goico B,Martin M,et al. (2004) Modulation of hippocampal cell proliferation,memory,and amyloid plaque deposition in APPsw (Tg2576) mutant mice by isolation stress. Neuroscience 127(3): 601- 609. Haughey NJ,Liu D,Nath A,et al. (2002) Disruption of neurogenesis in the subventricular zone of adult mice and in human cortical neuronal precursor cells in culture,by amyloid beta-peptide: implications for the pathogenesis of Alzheimer’s disease. Neuromolecular Med. 1(2): 125-135. Jin K,Peel AL,Mao XO,et al. (2004) Increased hippocampal neurogenesis in Alzheimer’s disease. Proc Natl Acad Sci USA. 101(1): 343-347. Hodges H,Veizovic T,Bray N,et al. (2000) Conditionally immortal neuroepithelial stem cell grafts reverse age-associated memory impairments in rats. Neuroscience. 101(4): 945-955. Cholerton B,Gleason CE,Baker LD,et al (2002) Estrogen and Alzheimer’s disease: the story so far. Drugs Aging. 19(6): 405-427. Wilson,RS,Mendes De Leon CF,Barnes LL,et al. (2002) Participation in cognitively stimulating activities and risk of incident Alzheimer disease. JAMA 287(6): 742-748. Arias-Carrión O,Freundlieb N,Oertel WH,et al. (2007) Adult neurogenesis and Parkinson's disease,CNS Neurol Disord Drug Targets. 6(5): 326-35. Martine Geraerts,Olga Krylychkina,Veerle Baekelandt,et al (2007) Concise Review: Therapeutic Strategies for Parkinson Disease Based on the Modulation of Adult Neurogenesis. Stem Cells,25(2): 263-70. Tran PB,Miller RJ,(2005) HIV-1,chemokines and neurogenesis. Neurotox Res 8(1-2): 149-58. Kitayama H,Miura Y,Ando Y,et al (2008) Human immunodeficiency virus type-1 vulnerates nascent neuronal cells. Microbio Immunol 52(2): 78-88.